Good Clinical Practice (GCP) inspection is necessary to ensure the protection of the rights, safety and well being of study subjects as well as to assure the integrity of scientific testing and study conduct. It helps to determine whether local trials are conducted in accordance with Malaysian Guidelines for GCP, ethical standards and other applicable regulatory requirements. 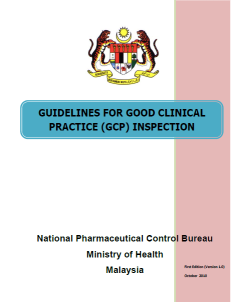 The formulation of this Guideline for GCP Inspection is indeed very timely and necessary as more drug-related clinical trials are conducted in Malaysia. This guideline is intended to provide comprehensive information on National Pharmaceutical Control Bureau (NPCB) inspection programme and covers inspections at the clinical trial sites, clinical laboratories, computer systems, sponsors and/or contract research organisations (CRO), bioequivalence studies and independent ethics committee/ institutional review boards. This guideline is also intended to serve as a guide to the sponsors/CROs, local investigators and others on NPCB inspection procedures. Apart from the above, the guideline also provides additional information on how observations/non-compliances recorded during the inspections of drug related clinical trials can be classified based on the severity of deviations noted. The examples listed in the guidelines however are not exhaustive and merely serve as illustrations. They should certainly be interpreted on case to case basis. Finally, I wish to take this opportunity to congratulate and extend my deepest appreciation to the committee members on Guidelines for GCP Inspection for their hard work and contribution which have ensured the success of this first edition of the Guidelines for GCP Inspection.